Academic Background: PhD in Sociology from the University of Quebec in Montreal, MA in Management of Cooperative Organizations from the University of Sherbrooke (Quebec), BA in Law from the University of Reims (France). I also completed a Certificate in Race Relations from the National Coalition Building Institute in Washington. The main focus of my research is on the role and impact of governance and leadership in the African continent. Recent research includes emerging leadership academic programs with a focus on curricular designs. Doctoral Fellowship in Urban Development, International Development Office, Université du Québec à Montreal (UQAM) 2001. I have supervised independent research projects or MRPs for students working on leadership related topics. I also sat on several Masters thesis and PhD committees for students working on issues related to Africa, International Development, Integration, Diversity and Leadership. I am willing to continue supervising students working in these topics. Shizha, E. & Diallo, L., (Eds), “Africa in the Age of Globalization: Perceptions, Misperceptions and Realities”, Ashgate (England), 2015. McLaren, P., McGowan, R., Gerhardt, K., Diallo, L., and Saeed, A., “Business without the Math: Competing Discourses and the Struggle to Develop an Undergraduate Leadership Program” Journal of Leadership Educators, Volume 12, Issue 2, 2013. Gerhardt, K. and L. Diallo, “Exploration of Leadership Undergraduate Curricula: A Practical and Critical Review” International Journal of Higher Education and Democracy, Volume 4, pp. 94-115, Published by State University of New York Press, 2013. Diallo, L., « Rapport D’Évaluation : Projet Santé Communautaire Globale et Projet de Concertation pour la coordination des interventions en santé auprès des aînés francophones en milieu minoritaires », soumis au Réseau Santé en Français (Terre Neuve-et-Labrador), Avril 2013, Projet financé par le Ministère de la Santé du Canada. Diallo, L. « Rapport D’Évaluation : Établissement d’une Clinique bilingue à St-Jean (Terre-Neuve-et-Labrador) », projet soumis à l’Association communautaire francophone de St-Jean et la Fédération des francophones de Terre-Neuve-et-Labrador, Avril 2013, Projet financé par le Ministère de la Santé du Canada. I was involved in several international projects in several African countries, including: Senegal, Guinee, Benin, Democratic Republic of Congo. 2002 - Development of an Observatory on Decentralization (International Project) Republique de Guinee, West Africa, Funded by the World Bank. 2010 Member of the International Leadership Association. 2003 Present: Social Innovation Research Group. 2003 Present Member of the Canadian Sociological Association. 2007 Member of the Provincial Centre of Excellence for Child and Youth Mental Health. 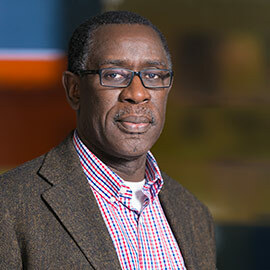 2004 Member of the Executive (Comité directeur), Groupe de discussion et de réflexion sur l'Afrique – OMD-GERSA, Université de Laval, Québec and Université du Québec à Montréal (UQAM). 2004 Present Member of ARUC-Quebec, International Network of Researchers in the Area of the Social Economy. Office hours: Wednesdays and Fridays from 1 p.m. to 3 p.m. or by appointment.